Los Angeles officials have confronted the reality that City Hall, the iconic government center, featured in countless movies and television shows, is pest-ridden, so overrun that workers have been ordered not only to fumigate but also to eliminate wherever possible carpets and to double-check draperies. A crackdown has been instituted on workers eating at their desks and storing food in their offices. In a controversial and emotional speech, a City Council member has called on the Los Angeles Police Department, headquartered in a sleek new building across the street, to step up efforts to deal with homeless encampments on City Hall grounds and nearby. Experts say that Southern California’s homeless crisis contributes to but shouldn’t be blamed as the sole cause of outbreaks of not only typhus but also hepatitis and tuberculosis. Federal health officials found themselves having to issue a special nationwide advisory about a hepatitis A epidemic in 2017 after outbreaks in Skid Rows in San Diego, Santa Cruz, and Los Angeles, as well as in areas around Detroit, Salt Lake City, Indianapolis, and across Kentucky. In Frankfort, the capital of the Bluegrass state, lawmakers are still investigating the public response to the hepatitis outbreak that infected at least 4,100 and resulted in 43 deaths. The Louisville Courier-Journal has raised questions about how urgently and widely state officials responded to the infections. 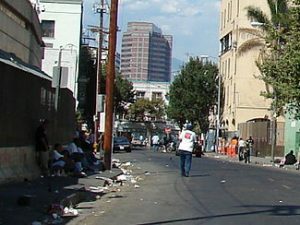 As contagions sweep not only Los Angeles but also New York and Texas, public health officials point out that hygiene and basic sanitation plunges in homeless areas, with residents and those who try to care for them struggling with adequate bathroom facilities, showers, and vermin infestations. Encampments, including those in the Washington, D.C., area, can decline into health situations as poor as those that can be found in the developing world or in medieval times when, as the Kaiser Health News Service reported, people “lived in squalid conditions without clean water or sewage treatment.” Los Angeles police have just reported on endemic criminality, much of it victimizing the homeless, and the costs of trying to clean up fetid camps across the city. Typhus debilitated or killed thousands of soldiers during medieval campaigns for conquest across Europe, whether Spanish troops in a siege of Grenada or Napoleon’s forces retreating from a Russian debacle. The disease was a nightmare in Old World jails. It claimed many soldiers during the U.S. Civil War. In my practice, I see not only the harms that patients suffer while seeking medical services, but also their struggles to access and afford safe, efficient, and excellent medical care. It is unacceptable and horrifying to think how, as difficult as health care already can be, what may happen if the nation heeds the self-absorbed and selfish and fails to protect us all with not only health basics — decent food, clean water, sanitary living conditions — but modern, appropriate health care, too. Epidemiologists have warned for some time now about the grave risks posed by the rise and possible fast spread of drug-resistant TB. Besides typhus and hepatitis, the nation also is battling outbreaks of measles, mumps, and meningitis. Flu, seasonal or not, persists as a serious health threat. An un-vaccinated Oregon boy just racked up more than $1 million in medical bills and required around-the-clock care by more than 100 medical personnel for 57 days after he got a rare case of tetanus when he got a cut on his forehead. Politicians and public health officials find themselves pleading with the public to reject unfounded, counter factual nonsense and to protect not only themselves individually but all of us by getting a range of safe, proven, effective, and appropriate vaccinations. We’re not islands. We’re part of the great herd of humanity with a collective immunity. In health terms, when we protect each other, we safeguard ourselves. When we share with health insurance the risks and costs of life’s catastrophes, we minimize the individual and collective damage that disease and injury can cause. Homelessness may be among the toughest of challenges the nation confronts. Those without residence may need mental and physical health services, substance abuse and addiction services, and sustained help with jobs and managing life’s basics, including finding and keeping a place and budgeting to do so. It also is true that the working poor all too often now, especially in burgeoning and popular cities like Washington, New York, and LA, are losing residences to affordability. The un-sheltered aren’t all part of the stereotype—disturbed, jobless, and transient. In LA, an area with acute housing shortages, a preponderance of the homeless aren’t strangers who just moved to the warm city, they’re longtime and dispossessed residents. Federal budgets, meantime, aren’t carved in stone and they’re never guaranteed to be enacted. They tell tons, though, about the priorities of the leaders that offer them. The Trump Administration would savage public support for health and mental health programs and non-defense discretionary spending, including low-income housing. The president and the Republican Party insist cuts must be made as they splash budgetary red ink across the capital. They’ve given wealthy corporations and the richest few a $1 trillion tax cut. Somebody must pay for it. And if plagues sweep the land, that may be part of the toll.